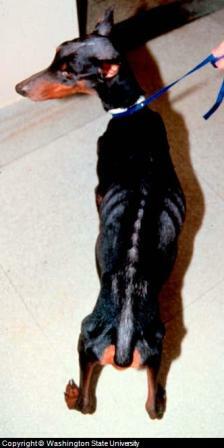 "Canine liver disease has multiple causes including infection, cancer, medications and various toxins. Symptoms include an enlarged abdomen, vomiting weight loss and diarrhea. Treatment options are surgery, medications and dietary change including supplements." The liver is responsible for filtering waste products from the blood and for producing bile, which is used to aid digestion. It is part of the digestive system that links the liver, gallbladder and pancreas. Liver disease is very serious because the body cannot survive without a functioning liver. Your vet will perform a thorough physical exam, including palpating your dog's abdomen to feel for the size of the liver. He or she will also do blood tests to check for elevated liver enzymes, which would indicate liver problems. A urinalysis may also be done to check for bilirubin (a product of the liver) and to evaluate kidney function, which may be affected by the liver. X-rays and/or an ultrasound can be used to see the size of the liver and to look for tumors. A liver biopsy can be performed for a more accurate diagnosis, but this can be a risky procedure because the liver produces coagulation factors (things that help the blood clot) and with some liver disorders these are not produced, making excessive bleeding a concern. Treatment for canine liver disease depends on the cause. In some cases, treatment is limited to supportive care. That means IV or subcutaneous fluids to prevent dehydration, medication to stop vomiting, and providing adequate nutrition. Medications can be used to help treat canine liver disease, but they must be used with care. The liver helps to break down medication, but when the liver is diseased, it does not break them down as rapidly as normal, so lower doses must be given. Corticosteroids can be given to reduce inflammation. They also help to stimulate the appetite. In high doses, they can actually cause liver damage however, so they must be used with care. Antibiotics are often given to prevent secondary bacterial infections. Medications are used to stop vomiting and prevent ulcers. Diuretics are used to decrease fluid build up in the abdomen; otherwise it will cause difficulty breathing as it puts pressure on the diaphragm. Herbal and vitamin supplements are often recommended for dogs with liver disease. They have a long history of successful use in promoting liver, gallbladder, and pancreatic health and functioning, all key components of the digestive system. They can be used alone or as part of the total treatment strategy, depending on the diagnosis and the recommendations of your holistic vet. Vitamin K is recommended as it is needed to help blood clot, and a diseased liver produces and stores less of this vitamin than normal. Vitamin E is recommended as an anti-oxidant to remove free radicals and prevent further oxidative injury to the liver. Carduus marianus (Milk thistle): One of the most important herbal liver restoratives. Milk Thistle has been subjected to many clinical trials which demonstrate its effectiveness. Scientific analysis shows that it contains a flavonoid complex called silymarin, which is a powerful anti-oxidant and has a positive effect on liver cells as well as overall liver functioning. Arctium lappa (Burdock): Well known herb used as a blood purifier, system cleanser and digestive aid. Chelidonium majus (Greater Celandine): Digestive tonic which promotes liver health. Clinical trials have supported this usage, and extracts of Celandine have been shown to promote the production of bile and pancreatic digestive enzymes. Kalium muriaticum (D6) (Kali. mur. ): One of the most important biochemic tissue salts when it comes to liver health. Acts as a system cleanser and purifier, it is essential for supporting liver and digestive function. Natrium phosphate (D6) (Nat. phos. ): Benefits the liver and gall bladder. Used regularly, it can help to promote the flow of bile from the gall bladder. Natrium sulphate (D6) (Nat. sulph. ): Helps to detoxify the liver and to ensure the supply of bile from the gallbladder. It also helps pancreatic health and with insulin production. A good source for a supplement that combines all of these ingredients is PetAlive Liver-Aid Formula. It is made to naturally eliminate toxins and strengthen resistance against disease and infection. Check with your veterinarian so that he or she can track any progress your dog makes with these types of supplements. Have A Question or Want to Share Your Experience about a Dog Liver Problem? Do you have a dog liver condition related question or experience to share? Help other dog owners! We'll select 1 question to answer each week.